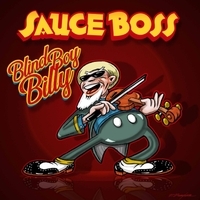 I just had the opportunity to review the most recent release, Blind Boy Billy, from Sauce Boss and it's a different recipe from earlier releases with David Davidson featured on strings. A companion to just released memoir entitled The Life and Times of Blind Boy Billy not only tells Wharton's story but includes a songbook and a cookbook. Opening with the title track, Blind Boy Willie, Sauce Boss (Bill Wharton) leads the way on vocal, guitar and one man band, accompanied by Davidson, Joe Murphy on sousaphone, Dennis Holt on snare and Jamie Paul and Jason Eskridge on backing vocals. A bluegrass flavored track, Davidson winds it up Charlie Daniels style. On Jimmy Buffett's I Will Play For Gumbo, Sauce Boss on lead guitar, one man band and guitar parties over cool sousaphone work by Murphy. Foot stompin' blues rocker, Little Driver, is raw and gutsy with cool slide and primitive rhythm. Otis Redding's, Dock Of the Bay, is polished and soulful with acoustic/slide and just the right amount of spice (sousaphone). Very nice. Another of my favorites is What She Gonna Do with Boss on a roaring electric slide and nothing but simple vocal and heavy foot pedal. Solid. Wrapping the release is Pleasures Of The Deep featuring a string quartet of David Davidson and David Angell on violins, Monisa Angell on viola and Carol Rabinowitz on cello. A somber ballad with Boss upfront on vocal and a soothing backing melody, this is a solid closer.